Astronaut John Glenn dresses in his silver Mercury pressure suit preparing for his first orbit around Earth in 1962. 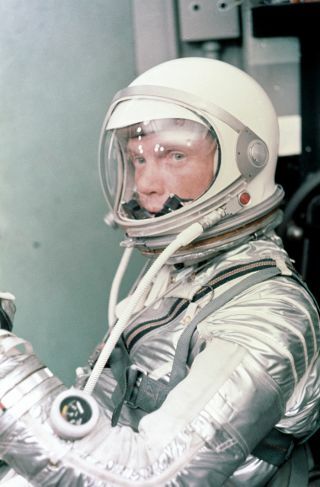 In this historical photo from the U.S. space agency, Astronaut John H. Glenn Jr. dons his silver Mercury pressure suit in preparation for launch. On February 20, 1962 Glenn lifted off into space aboard his Mercury Atlas (MA-6) rocket and became the first American to orbit the Earth. After orbiting the Earth 3 times, Friendship 7 landed in the Atlantic Ocean 4 hours, 55 minutes and 23 seconds later, just East of Grand Turk Island in the Bahamas. Glenn and his capsule were recovered by the Navy Destroyer Noa, 21 minutes after splashdown.